I am replacing a totaled 2013 Infiniti G37x Sport, and I am looking at a 2013-2014 Taurus SHO. I am just trying to get general impressions on the vehicle in comparsion to my previous one. I know it will probably be slightly quicker and will not handle as well, but I am more concerned with build quality and reliability. According to TrueDelta the average Taurus has a little above average reliablity. 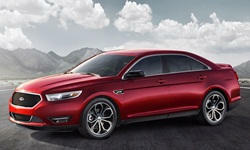 According to Consumer Reports, the average Taurus has average realiability. Either way, it is not terrible but not the best either. Compared to your Infiniti, the reliablity is about the same. Within a few percentage points of each other. If the Infiniti was fine, chances are the Ford will be okay as well for you. I wouldn't be too concerned about reliability with the newer Tauruses. There are better cars for the money though. The Hyundai Genesis comes to mind and have lost most of their value by now. They are also pretty reliable. My wife had a horror story with her early 90s Taurus Wagon. Complete lemon. Things have changed by now, so I wouldn't worry.